It’s a pretty simple equation: Clipper Vacations + a Hoppy Hour Bike Tour full of craft beer tasting = an awesome time in Victoria, British Columbia. There’s no easier way to get to Victoria than through Clipper Vacations. 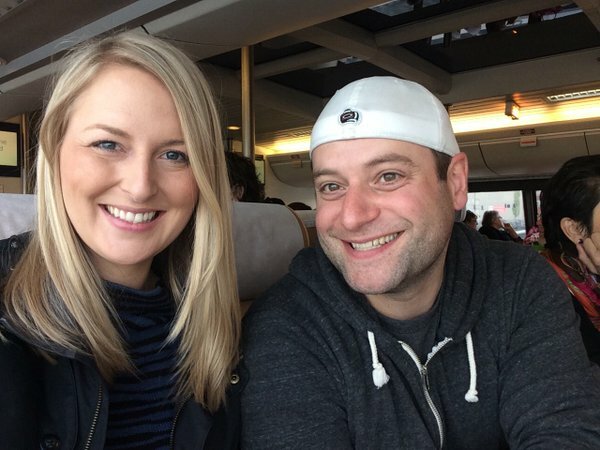 The Pacific Northwest vacation experts offer a number of transportation, tours and accommodation packages to customers across the world. The Victoria Clipper is an easy, quick and relaxing way to travel. The high-speed boat goes as fast as 30 knots, and takes less than three hours to get to Victoria from Seattle (or vice-versa). 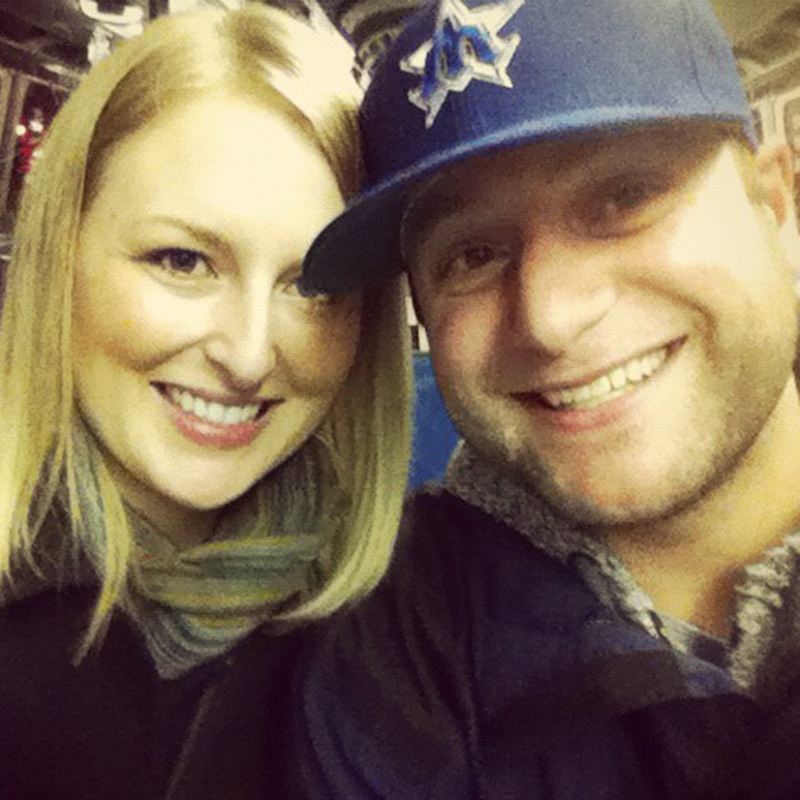 There are no assigned seats on the Victoria Clipper. The earlier you book your trip, the better boarding number you receive — which means the better seat you get on the boat. We lucked out and got a window seat both to and from Victoria. 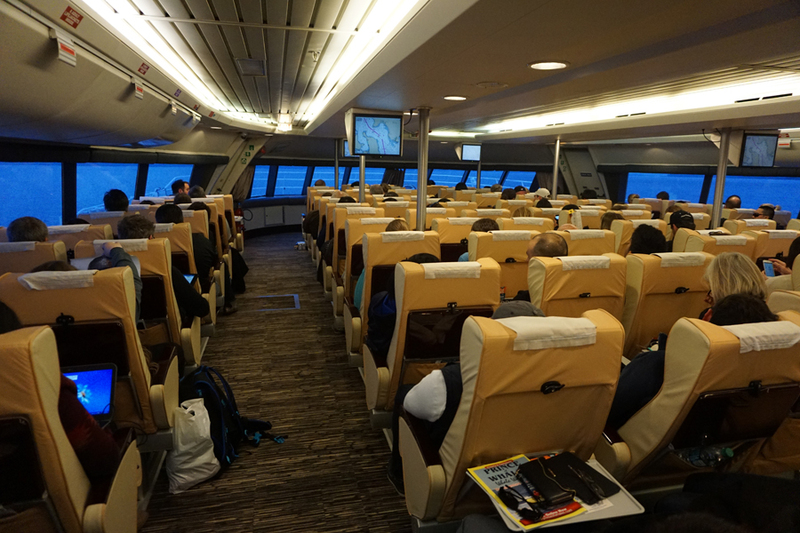 Once on board the Clipper, you’re allowed to walk around, check out the outdoor deck, or just kick back and relax. There is food and beverage service on board. The friendly staff can also help you book tours and activities for your adventure to Victoria. You can honestly plan your entire trip while you’re on the boat. The seats on the Victoria Clipper are comfy! Book early to board early and snag the perfect seat. If you book a trip through Clipper Vacations, be sure to check out the company’s FAQs webpage. They have a lot of useful information about parking, luggage, boarding, and customs. Clipper Vacations is much more than a mode of transportation. They also offer loads of activities and tours. They helped us book the Hoppy Hour Bike Tour through The Pedaler (321 Belleville Street). The three-hour adventure takes you through the streets and bike trails of Victoria, stopping at three brewpubs along a six kilometer trek (3.8 miles for us Americans). Our tour guide stopped us along the way to share history about beer in Victoria. 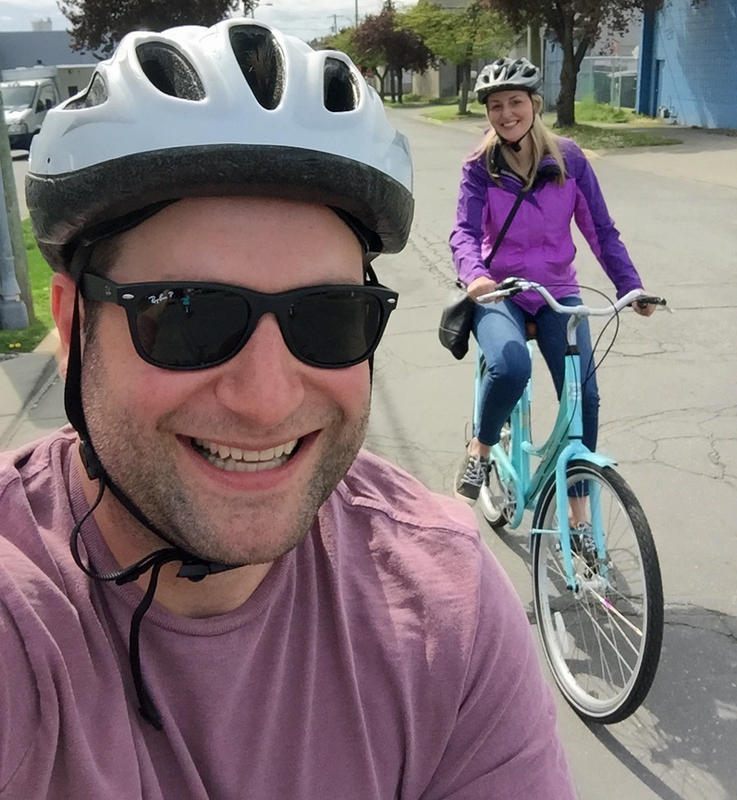 After being equipped with a helmet and a bike, The Hoppy Hour Bike Tour departed at 1:00 p.m. Not much later we were at the first brewpub: Spinnakers for beer and chocolate pairings. Spinnakers (308 Catherine Street), known as the grand-daddy of Victoria craft beer (as we learned on our tour — along with other historical facts about beer making in Victoria), has an in-house chocolatier. So, they not only brew their own beer; they also make their own chocolate. When you put them together — it’s doubly as good. 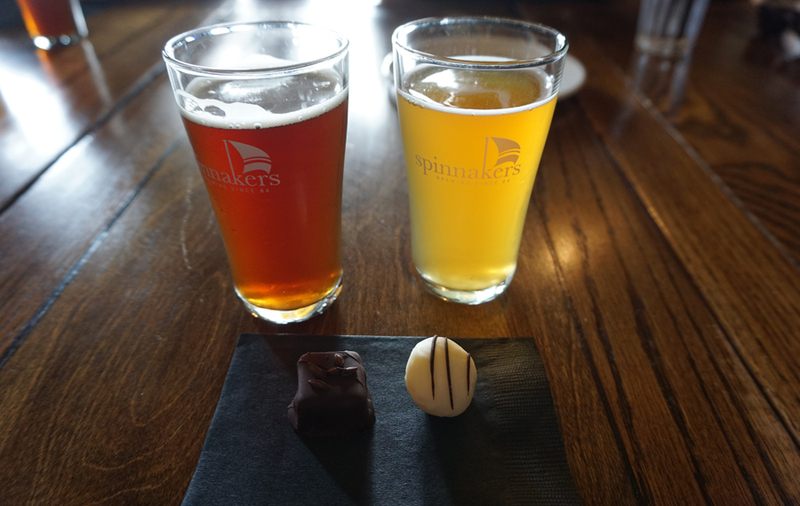 Chocolate and beer pairing at Spinnakers. After sampling a few different beers and eating a couple of chocolates at Spinnakers, the Hoppy Hour Bike Tour took us to Moon Under Water Brewpub (350 Bay Street). This was our favorite location of the three places we stopped. The atmosphere is fun, they have tasty onion rings, and most importantly they make good beer. We especially liked Moon Under Water’s pilsner and sour beer. 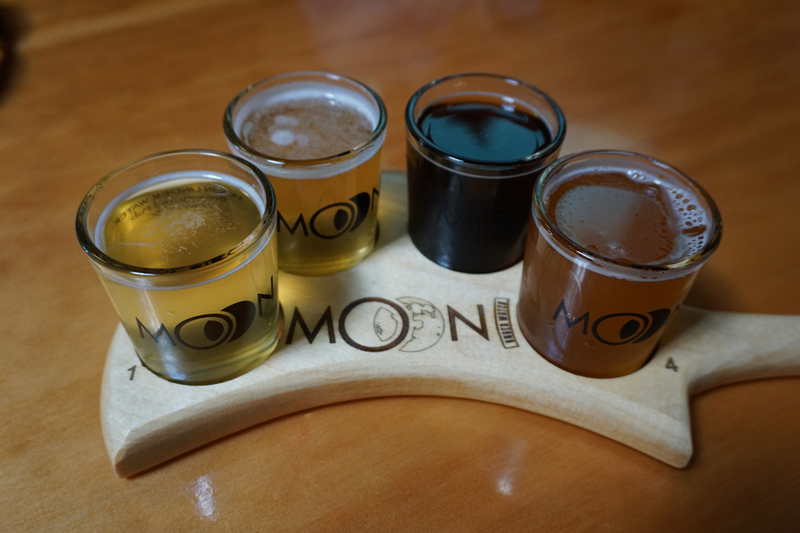 We tasted four beers at Moon Under Water. The Hoppy Hour Bike Tour then leads you past a few more Victoria breweries. 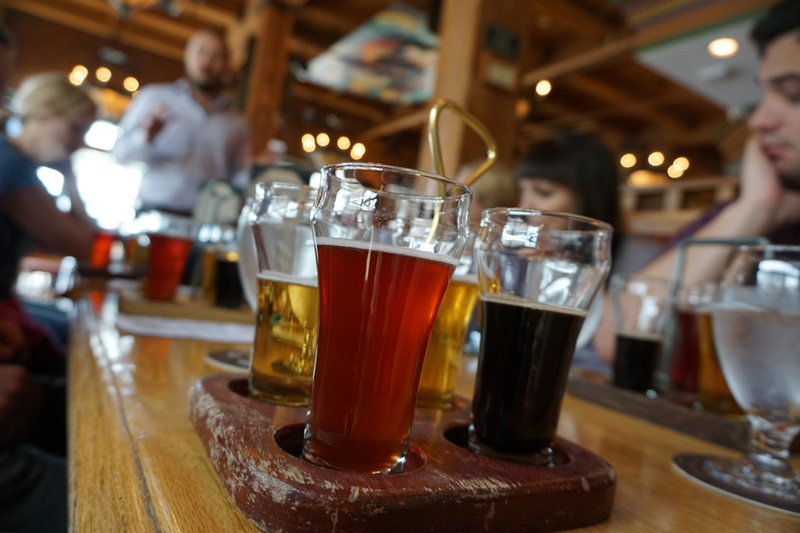 You don’t actually stop in for a beer, but you get to learn more about Vancouver Island Brewery, Phillips Brewing, Driftwood Brewery, and others. After cruising past the other breweries and working up some thirst, we made the final stop at Swans Brewpub (506 Pandora Avenue). Outside of Swans Brewpub in Victoria! The beer at Swans was served by a very knowledgable staff member who talked us through every brew we were trying. When we asked him a question he didn’t know the answer to, he hopped on his phone to get the information for us. Now that’s service! NOTE: The Hoppy Hour Bike Tour stops at three of four locations. When we went, we visited Spinnakers, Moon Under Water, and Swans, but other tours stop at Canoe Brewpub (450 Swift Street) in place of one of the others. Our server at Swans tells us about their beers before we dive in. 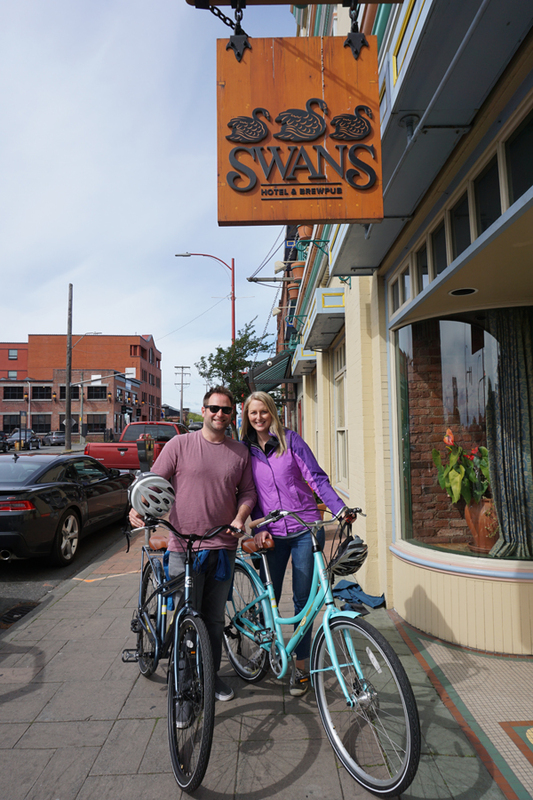 Once we finished our drinks at Swans, it was time for a short ride back to The Pedaler. We returned to the shop around 4:30 p.m. (so…a little longer than three hours) with a slight buzz and some new friends. Our group for the Hoppy Hour Bike Tour had eight people, which was the largest group our guide had ever taken out before (and she said that’s about where they max out). We didn’t know anyone at the start of the tour, but we all shared plenty of laughs along the way. If you’d like to experience the Hoppy Hour Bike Tour for yourself, click here for more information. Like we mentioned before, you can book the Victoria Clipper and the tour all in one place. Clipper Vacations makes it very easy for you! A fashion statement? No. Fun? Definitely! If you plan on staying in Victoria, we recommend lodging at the Oswego Hotel (500 Oswego Street). It’s located just a couple blocks from the Victoria Clipper terminal and it’s also just a block and a half from The Pedaler. The Oswego Hotel isn’t in the heart of downtown Victoria. But, it’s just a short walk along the Inner Harbor to most of the city action. 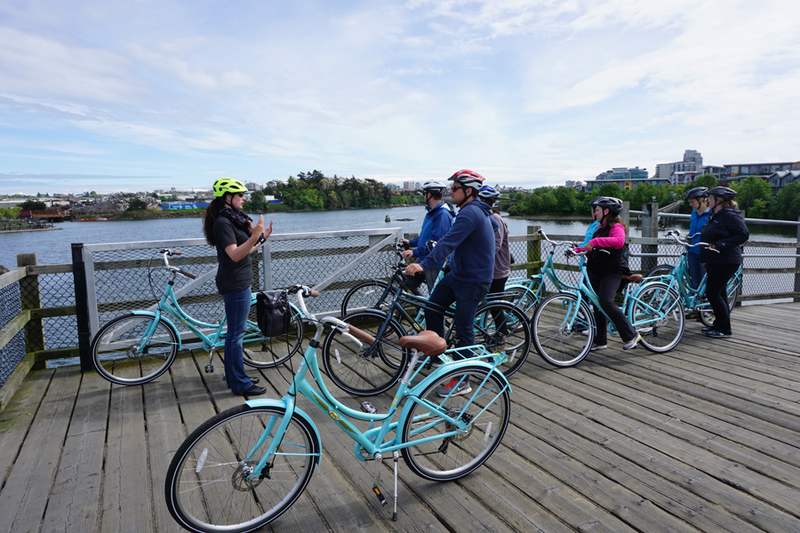 Have you ever done the Hoppy Hour Bike Tour in Victoria? How was your experience? We’d love to hear all about it! Please leave a comment below or connect with us on Twitter, Facebook, and Google+. Don’t forget to also check out Seattle Bloggers for more great places to visit around the Pacific Northwest! NOTE: In full disclosure, Clipper Vacations invited us to Victoria to take part in the Hoppy Hour Bike Tour. With that said, this is a very honest opinion about our trip on the Victoria Clipper, the Hoppy Hour Bike Tour, and Clipper Vacations.